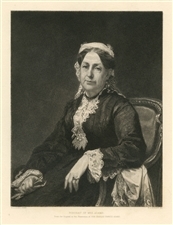 Stephen Alonzo Schoff etching "Portrait of Mrs Adams"
Medium: etching (etched by Stephen Alonzo Schoff after W. M. Hunt). Published in 1880 by the American Art Review. Image size: 7 1/2 x 6 inches. Not signed. Medium: etching (etched by Stephen Alonzo Schoff after Elihu Vedder). Published in 1880 by the American Art Review. Plate size: 5 1/2 x 9 inches. Plate-signed; not hand-signed.